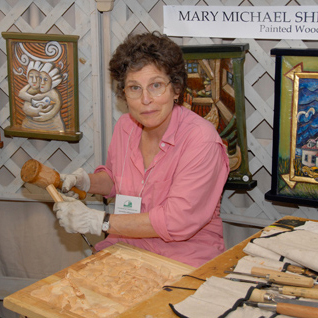 Mary Michael Shelley is a folk americana wood carver and painter. She is a self taught artist, having no formal education in the arts. She has been carving since she was 23 heavily influenced by her father and grandmother, both artists. Shelley’s work focuses on the joyous events in life. Her work has been reviewed in the New York Times, Folk Art Life, Voices, Nashville Arts, USA Today, and New American Paintings. Her work is collected by the Smithsonian Institute, American Museum in Britain, Museum of American Folk Art, National Museum of Women and Arts, and others. Her work has been exhibited nationally and internationally in Switzerland, Japan, and Britain. She lives and works in Ithaca, NY.